One of the first lessons I had at Sadhulu house was on scrying. The purpose of this lesson was to begin to see “beyond” our physical eye. We were encouraged to use the tools that we were personally drawn to in order to develop our psychic abilities. I am personally drawn to plant-life, dreaming and crystals, therefore I was instructed to focus my attention towards communicating with plants, working with crystals and interpreting my dreams. 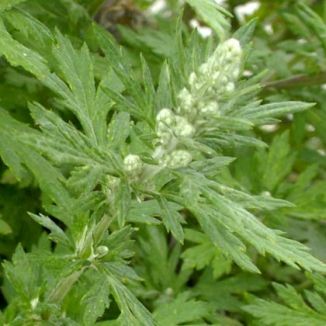 One plant that I am particularly fond of is Artemesia Vulgaris also known as mugwort, croneswort, black sage and common wormwood. As you can see from its name it is the herb of the Greek lunar deity Artemisia who is goddess of fertility, magic, psychic gifts and wild female nature. She is also said to be protector of girls until marriage. Making its first appearance in the early spring, gardeners are challenged with keeping mugwort under “control”. Its thick deep tough roots burrow deep into the soil making it almost impossible to uproot. Mugwort grows just about everywhere profusely. Instead of attempting to eradicate all of it, consider keeping a patch of mugwort for your spiritual work. I have successfully used mugwort in the following applications. Smudge stick: Using scissors clip 8” off of the top of the plant. You will need about 7 or 8 of these clippings. It is best to collect herb material for work during the full moon when the plant is at the height of its power. Lay out a long natural cord either made from cotton, tweed, hemp or any other natural material leaving 4” at the top and 18” at the base. Hold the base of your bundle and very tightly wind the cord closely together 4 times around the base including the run of the cord. Next, begin winding the cord with spacing about 1”-1-1/2” apart until you reach the top. Your bundle should be very compact. Once you reach the top wind cord closely again about 3-4 times. Last, tie your excess cord and your top cord together and knot three times. While making this stick, preferably, at your alter communicate with the plant and ask for her to impart her protective and clairvoyant powers into your space. Hang your bundle to dry for about a week in a well ventilated space out of direct sunlight. When you are ready to use it, light the leafy end where the stems are thin. A good time to burn mugwort is prior to divining. Dream pillow: Using scissors trim 6 inches off of the tops of 6 flowering plants. Bundle the bases with cord allowing the rest to be free. Hang them in a well ventilated area to dry for about 2-3 weeks. Now that the herb is dry, place the bundle in a sachet made of silk, muslin, cotton or any other natural cloth and place it under your pillow or inside of your pillow case. This plant helps you to remember your dreams and is said to evoke prophetic dreams. Bath: Follow the same steps as for the dream pillow but instead of placing it into a sachet place it in a large pot of cold water and cover it. Bring the water to a slow simmer on low heat and allow it to simmer for 15 minutes. Turn the heat off and allow to completely cool before opening the lid (at least 30 min). Add 2 cups of this strong tea to a bath of warm water while invoking Artemis to sharpen your psychic abilities. To this bath I have added rosemary essential oil which is used to stimulate clear thinking. This bath also doubles as an excellent floor wash that does a good job of resetting the energy of a home. When I used this floor wash I added 1 cup of ammonia, which is also used to clear out unwanted energy.